I have to admit to feeling very low after the whole "sticker-gate" of the early month. It bothered me, but perhaps these people had a point. Maybe most folks didn't want a sticker festooned envelope in their mailbox. Maybe most folks were embarrassed by that or by the thought that their mail person considered the sender more than a little weird. So, I just stopped. I set all the stickers aside and unless someone said they wanted stickers, I didn't put any on anything, no envelopes, no packages, no boxes. It felt weird taking all of this unadorned mail to the post office, but, as much as I felt sad, I knew I would get over it. Then the comments started coming. I am exceedingly grateful for the positive comments on the post. Positioning stickers on envelopes and parcels has become part of who I am and I'm grateful that many of you recognized it. I'm nothing if not adaptable but I'm feeling much better about this with all the kind words about not having to adapt. My friend, Meredith drove this point home by sending me a late birthday present. 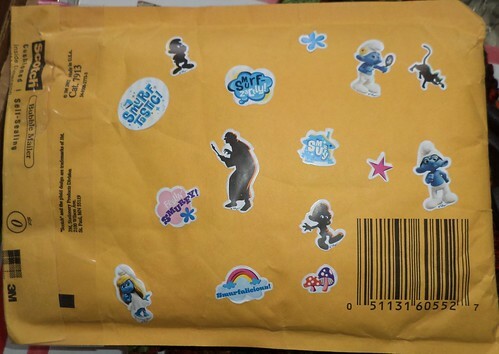 Arriving within 3 days of the column, was a small padded envelope covered in stickers. It made me laugh. I had just opened Amber's "create a garden gnome" gift so I instantly thought, "Oh boy! She sent Smurf seeds!" I opened the package and here are the contents. Stickers. Lots and lots of glorious stickers! Oh and a Dunkin' Donuts gift certificate which I have used 3 times already. Their holiday star donut is really good. It's gooey and vanilla creme filled and covered with star sprinkles on green icing. The red velvet donut is just 'meh'. It seems like red velvet is the Christmas equivalent of October's pumpkin flavor. I'll pass on the red velvet candies. It's almost time for the chocolate cherry M&Ms that are out for Valentine's Day. Must stock up on those. Anyway, I digress. So Meredith is tangibly encouraging me to set aside the comments of a few detractors and cover my cards and letters with stickers, just as I have always done. 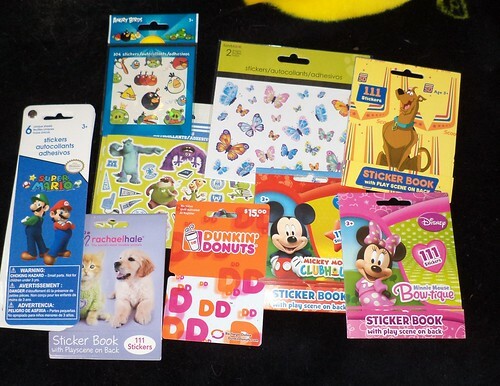 I looked through the sheets of stickers I've accumulated and it felt so wrong to just chuck them into the recycling bin. A comment from Nancy reminded me that I have earned the right to have some eccentricities in life and if the stickers gummed up the postal sorting machine, I'd have heard about it a long time ago. My friend Pam, reminded me that those telling me it was unbecoming really don't know me very well. So many of you felt a sadness when the Christmas card or box arrived and there was nary a sticker in sight. "I didn't know it was from you until I opened it." So, the stickers will be back with the Christmas 'thank yous'. I giggled. I laughed. I had great, great fun looking through all the pages of all these books of stickers Meredith sent. It sounds extremely egotistical to say, "This is what I enjoy. It doesn't affect your life. Deal with it. You can always just chuck my envelope into the trash." That sounds kind of harsh. For the record, one of the detractors was freed of ever having contact with me again. The other two, well, I just don't know. I'm thinking, gradually, our exchanges will become few and far between and the friendships will have run their course. It happens. I'm going to resume this little thing that gives me so much joy. Isn't that what life is about, really? Finding joy in small things, like stickers on envelopes.